While the summer can be lots of fun, the heat can sometimes become unbearable and this is when you start thinking about ways to cool yourself down. Here are some gadgets that can save you from a hot summer’s day and also help you maintain a cool look. Let’s start with something pretty basic, a fan. Of course, it wouldn’t be a cool gadget if it was just a fan so we have one that can connect by USB and which also acts like a lamp. This will make the time you spend at your desk much more comfortable and it also looks pretty good. 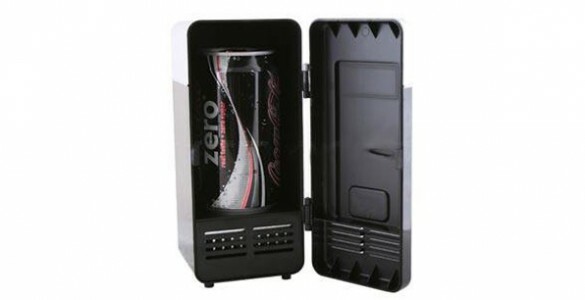 Since we are talking about gadgets to have around the desktop, how about a small fridge? Big enough to hold a can of soda and good enough to have it ready when you need it. You can connect it by USB to your PC or laptop and it can be a real lifesaver when you are dying for something cold to drink. It is cheap to buy and great to have around, not to mention that it only takes 5 minutes for it to get your can of soda to that perfect temperature. Moving forward to something a bit more practical, we have a portable air conditioner, just for you. All you have to do is wet the sponge and start it, you can take it wherever you want to and you will always feel the cool breeze. This will surely make some people jealous if you decide to take it on the bus or in a hot public place. Choosing a shirt that will keep you cool in the summer is not always easy so you can get one that has built in fans. You can power it from a USB, car charger or from batteries and it is supposed to guarantee that you don’t feel the heat. The main problem is when you want to go to sleep but you can’t due to the high temperature. To solve this problem in a cool way, you can get an air conditioned mattress which will guarantee a good night’s sleep. There is nothing better than this cool gadget and despite the somewhat high price, it is worth every last penny when you wake up and you feel relaxed. The heat does no longer seem like such a big problem when we have all these cool gadgets to choose from.